The owners of this private residence, requested a striking lighting effect for their outdoor wooden deck. 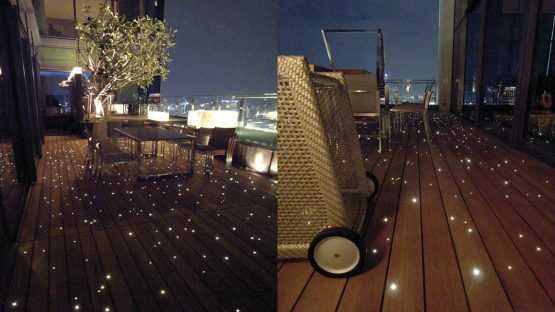 Lighting designer Atch Kosiyabong, from Chingchai & Sons Engineering, designed this extraordinary starry sky effect directly into the floor, the fiber tips sealed for invisible daytime finish. High performance HCF201, 1mm fiber optics clad with polyolefin HFFR powered by MDI105 series, 150W discharge illuminators, with 4000º K ceramic metal halide lamps and motorized starry sky effects disk.